The subject of the documentary You Don't Need Feet to Dance, Sidiki Conde, is possibly the very definition of determination and resilience. 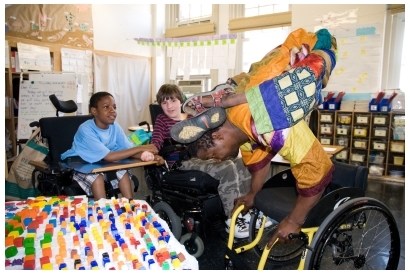 Born in Guinea, stricken with polio that lost him the use of his legs as a teen, overcoming that stigma by forming an orchestra of disabled artists that toured the country, Conde eventually found his way to New York City, where he performs as musician and dancer (yes, dancer), teaches disabled and non-disabled children, and just generally meets the challenges of the toughest city in the world with his own indomitable spirit. Director Alan Govenar (The Beat Hotel) takes us inside a few days in Conde's life, showing him tackling obstacles such as living in a fifth-floor walk-up, dealing with New York traffic, and motivating kids facing their own challenges. I met up with Sidiki and Alan in the musician's apartment for an in-depth discussion on the motives for this illuminating documentary and the complexities that accompanied its filming. Click on the player button to hear the show, or right-click the title to download. LIKE US ON FACEBOOK (PLEASE? ).